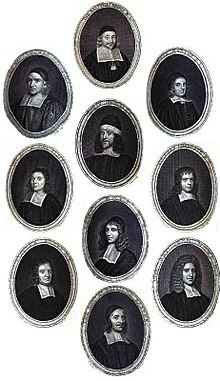 Gallery o famous 17t-century Puritan theologians: Thomas Gouge, William Bridge, Thomas Manton, John Flavel, Richard Sibbes, Stephen Charnock, William Bates, John Owen, John Howe, Richard Baxter. The Puritans war a group o Inglis Reformed Protestants in the 16t an 17t centuries who soucht tae "purify" the Kirk o Ingland frae aw Roman Catholic practices, maintainin that the Kirk o Ingland wis "anly pairtially reformed". This page wis last eeditit on 17 Februar 2016, at 00:45.